As a leading builder of custom garages, horse barns, storage buildings and other post frame structures, we understand how confusing construction terminology can be. Read on for a glossary of terms that will make your construction project easier to understand! Accessory – An extra building product. 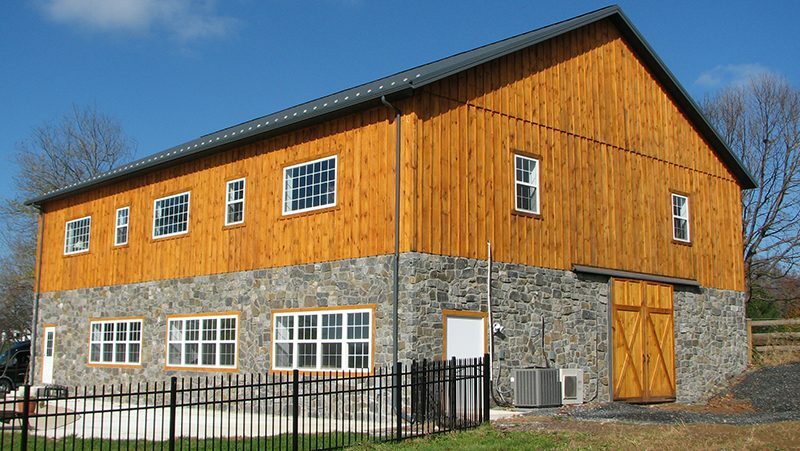 Agricultural Building – A structure designed and constructed to house farming implements, hay, grain, poultry, livestock or other horticultural products. Attic – The space between the ceiling beams (or joists) of the top story and the roof rafters (or purlins). Awning – An architectural projection providing weather protection, identity or decoration that is wholly supported by the building to which it is attached. An awning is comprised of a lightweight, rigid skeleton structure over which a covering is attached. B Exposure – Urban and suburban areas, wooded areas, or other terrain with numerous closely spaced obstructions having the size of single-family dwellings or larger. Exposure B shall be assumed unless the site meets the definition of another type exposure. Bay – The distance between adjacent mainframe (post-frames) centerlines or primary supporting members along the length of the building, measured parallel to the ridge. Beam – A structural member, usually horizontal, used for support in a building and subjected to bending loads. Beam and Column – A structural system consisting of a series of rafter beams supported by columns. Often used in animal “stall” or “grid” barns. Bearing Block – A dimensional lumber block placed beneath roof trusses, rafters or beams and nailed and/or bolted to a support column to provide extra support for vertical loads. Bearing Height – Vertical distance between a pre-defined baseline (generally the grade line) and the bearing point of a component. Bottom Chord – An inclined or horizontal member establishing the bottom of a roof truss. Bottom Girt (or Splash Boards) – Pressure treated lumber installed at grade line to which the bottom of the building siding is normally installed. Brace – A piece of structural material, either temporary or permanent, serving to strengthen another member, or to hold the member in place. Bridging – Structural blocking used to give weak axis stability to floor joists or roof purlins. Building Code – Regulations established by a recognized agency describing design loads, procedures and construction details for structures. Usually applying to designated political jurisdictions (city, county, state, etc.). Building Level (or Transit) – A surveyor’s instrument in which a telescope is mounted horizontally. Parallel to the ground, it can be used to determine a level point or points. Camber – A predetermined curvature designed into a structural member to offset the anticipated deflection when loads are applied. Cantilever – A beam or column supported only at one end. A sidewall column of a roof only structure is a cantilevered pole. The portion of a roof purlin extending beyond the gable endwall of a building to support an endwall overhang is cantilevered. Ceiling Joists – A secondary horizontal framing member attached between the bottom chords of trusses. Serves as a structural member to which gypsum wallboard or other ceiling finishing materials may be attached. Check – Separation of the wood usually extending across the annual growth rings (I.E., a split perpendicular-to-growth rings). Commonly results from stresses built up in wood during seasoning. Chords (or Bottom Chord or Top Chord) – An inclined or horizontal member establishing the top or bottom of a roof truss. Cladding (or Building Skin) – Refers to the exterior building covering. Clear Height – Vertical distance between the finished floor and the lowest part of a truss, rafter, or girder. NOT the same as eave height. Clear Span – Clear distance between adjacent supports of a horizontal or inclined member. Horizontal distance between the facing surfaces of adjacent supports. Closure Strip – A resilient strip; formed to the contour of ribbed panels and used to close openings created by metal panels joining other components. Typically used underneath ridge caps. Column – A rectangular primary structural member, sawn on four sides before treatment and generally uniform in cross section along its length. May be either sawn or laminated dimensional lumber. It is the primary structural element of the building side and end walls. They are a vertical structural member used in a building to transfer loads from main roof beams, rafters and/or trusses to the foundation. Usually also supports a horizontal wind load. Generally partly embedded in the soil to provide lateral and vertical support for the structure. Concrete Collar – Concrete placed into the pre-bored hole around a structural building column. The concrete may only fill a portion of the bottom of the hole, as individually determined for each engineered building. Compacted soil is then placed on top of the concrete to fill up the rest of the hole. The engineer of record specifies the depth of the concrete collar. In some localities, or due to high wind and/or snow loads, the concrete may entirely fill the hole. The collar provides superior resistance to wind uplift forces. Continuity – The terminology given to a structural system denoting the transfer of loads and stresses from member to member as if there were no connections. Corner Post – An end wall column located at the corner of the building. Dead Load – The vertical gravity load due to the combined weights of all permanent structural and nonstructural components of the building, including but not limited to: walls, floors, roofs, ceilings, stairways, built-in partitions, finished, cladding, and other similarly incorporated architectural and structural items, and fixed service equipment, including the weight of cranes. These loads are constant in magnitude and location throughout the life of the building. Deck – An exterior floor supported on at least two opposing sides by an adjacent structure, and/or posts, piers or other independent supports. Deflection – The displacement of a structural member under load. Deflection limits are not normally required for unfinished post frame buildings but need to be considered for finished buildings incorporating gypsum wallboard, etc. Design Loads – Those specified by the building codes to be used in building design. They include snow, wind, seismic and dead. Design Strength – The product of the nominal strength and a resistance factor (or strength reduction factor). Dimensional Lumber – Wood members from two nominal inches to, but not including, five nominal inches in thickness, and two or more nominal inches in width. Door Guide – An angle or channel guide used to stabilize or keep plumb a sliding or rolling door during its operation. Dual Pitch Roof – A gabled roof system where the slope on one side is steeper than the other. Duration of Load – The period of continuous application of a given load, or the aggregate of periods of intermittent applications of the same load. Dynamic Loads – Result from the dynamic effect of cranes, hoists and materials handling equipment. Eave – The edge of the building where the sidewall and the roof meet. The line along the sidewall formed by the intersection of the wall and roof planes. Eave Girts or Eave Purlins – Horizontal, secondary framing members attached (generally at a right angle) at sidewall columns at the eave to support wall coverings and/or the lower edge of the roof cladding. They collect the wind-induced wall loads and distribute them to the post frame. Eave Height – The vertical distance from the bottom of the skirt board to the eave. (NOT the same as eave clearance). Eave Lights – Fiberglass reinforced panels (FRP), typically of the same rib configuration as the sidewall steel. Normally placed in the top two to three feet of the sidewalls, directly below the eave. Generally made from opaque material, allows for some natural lighting into the building. Eave Vents – Level return enclosed soffits, pre-perforated to allow for airflow into the building. In combination with a vented ridge, allows warm, moist air to escape through the ridge of the building. Elevated Floor (or Loft) – A second story wood floor (normally plywood) supported by beams and joists. End Bay – The bays adjacent to the end walls of a building. Usually the distance from the end wall to the first interior primary frame measured parallel to the ridge. End Rafter – Dimensional lumber used to support the vertical roof load between endwall wind columns. Endwall – When looking at this wall of a peaked or gabled roof, it has a “point”. An exterior wall which is perpendicular to the ridge of the building. Endwall Diaphragm – The endwall of the building where the endwall cladding and framing are constructed so as to transfer in-plane shear forces from the roof and/or ceiling to the ground. Endwall Overhang – The projection of the roof past the endwall. Endwall Wind Columns – A rectangular primary structural member, sawn on four sides before treatment, is generally uniform in cross section along its length. May be either sawn or laminated dimensional lumber. It is the primary structural element of the building endwalls. They are a vertical structural member used in a building to transfer loads from endwall roof beams, rafters and/or trusses to the foundation. Also supports a horizontal wind load. Generally partly embedded in the soil to provide lateral and vertical support for the structure. Entry Door (or Man Door or Walk Door) – A pre-hung, hinged door allowing for access into the building by turning a lockset. Most popular size is 36 inches in width by 6’8″ in height. Fascia – Flat surface (or covering) located at the outer end of a sidewall roof overhang or cantilevered end. Fastest-mile Wind Speed – The wind speed obtained from wind velocity maps prepared by the National Oceanographic and Atmospheric Administration and is the highest sustained average wind speed based on the time required for a mile-long sample of air to pass a fixed point. Ferric oxide – A chemical composition that produces a rust-like color which is often used in the production of red paint and metal polishes. 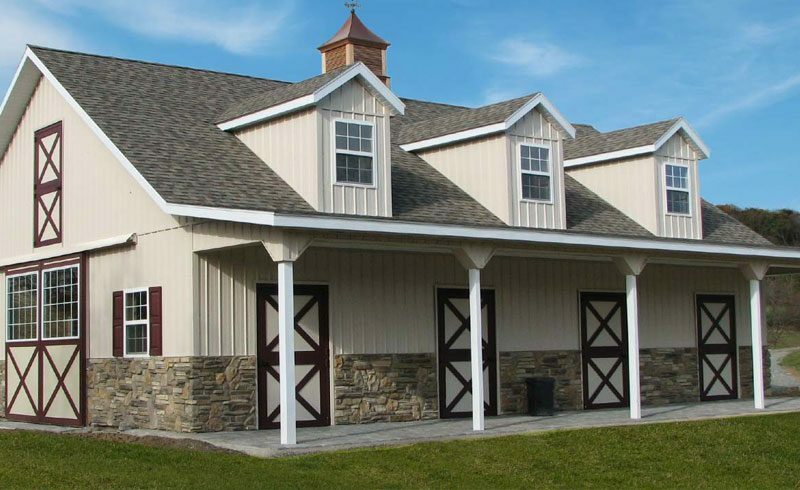 Many barns and post-frame structures across the Mid-Atlantic US were originally painted in red due to the availability of this substance and its preservative properties. Today, red is still one of the most popular colors used in post frame construction. Fill – Material used to raise the level of a grade. Flashing – Sheet metal or plastic components used at major breaks and/or openings in walls and roofs to insure weather-tightness in a structure and secondarily to enhance appearance. Footing – Concrete placed under a structural column, wall or other structural member to transfer loads from main framing members to the soil by distributing loads over a greater soil area. Normally not required when column holes are backfilled with concrete. Foundation – The substructure which supports a building or other structure. Frame – Primary structural member (columns and rafters) which support the secondary framing. Frame Spacing – Horizontal distance between post-frames. In the absence of posts, the frame spacing is generally equated to the distance between adjacent trusses (or rafters). May vary within a building. Framed Openings – Jambs, headers and flashing which surrounds an opening in the wall of a building. Full Hip Roof – One which rises by inclined planes from all four sides of a building. A roof system without gables, where the roof slopes towards every wall. The line where two adjacent sloping sides of a roof meet is called the “hip”. Gable – On a roof system with a peaked end (or ends), the triangular portion of the endwall above the eaveline. Not structurally a good location for placement of fiberglass wall lights, as it breaks the endwall diaphragm. Gable Roof – A ridged roof terminating in gables. A roof with one slope on each side. Each slope is of equal pitch. 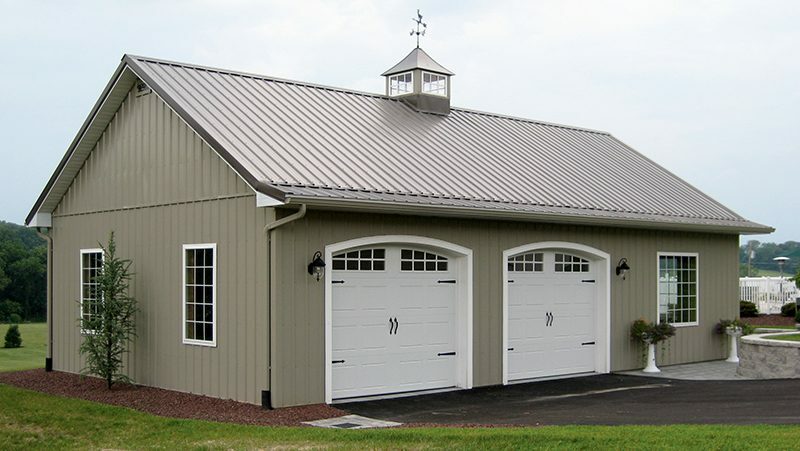 Gambrel Roof – This is the “traditional barn” style roof. Similar to a gable roof, only has a pitch change from steep at the eaves to a lesser slope approximately mid-point between the eave and ridge. May have useable attic space. Girts – Horizontal, secondary framing members attached (generally at a right angle) to endwall or sidewall columns to support wall coverings. They collect the wind-induced wall loads and distribute them to the post frame. Glued-Laminated (Glu-Lam) Timber – A structural timber manufactured in a plant, consisting of assemblies of suitable selected and prepared wood laminations in which the grain of all lumber laminations is approximately parallel longitudinally, bonded together with adhesives. Grade Girt (or Skirt Boards) – Pressure treated lumber installed at grade line to which the bottom of the building siding is normally installed. Grade Line (Grade Level) – The line of intersection between the building exterior and the top of the soil, gravel, and/or pavement in contact with the building exterior. For post-frame building, generally assumed to be no lower than the lower edge of the skirt board. Headers – A structural framing member supporting the ends of structural framing members cut short by a floor, wall, ceiling, or roof opening. Normally used to support roof trusses over wide sidewall door openings. They are primary structural elements of a post frame building. Commonly used members are dimensional lumber, vertically nail-laminated lumber, laminated veneer lumber, glued-laminated beams and pre-fabricated parallel chord trusses. IBC – International Building Code. 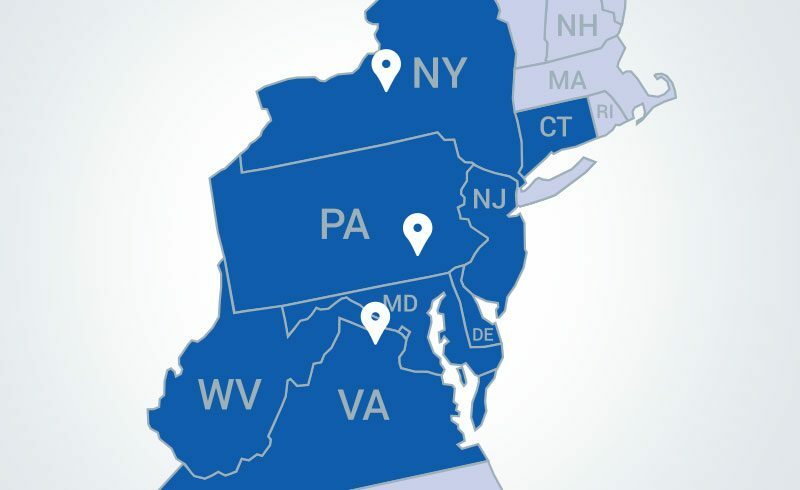 A unified national building code based upon years of experience and technical expertise from the organizations which created the BOCA National Building Code, ICBO’s Uniform Building Code and SBCCI’s Standard Building Code. First published in 2000. Inspections – In construction where a building permit is required, it is the review of work performed by a building official. Typical inspections for pole buildings include (but are not limited to) the holes, framing and final inspections. Interior Clearance – The vertical distance measured from the top of a finished floor to the bottom of the roof trusses. Intermediate Bay – The distance between two primary frames within a building, other than the end frames. Joist – Any of the pieces of lumber arranged parallel from wall to wall (or truss to truss) in a structure to support a floor or ceiling. Joist Hanger – An engineered metal bracket allowing a member, such as a purlin, to be supported from the side of a second member, such as a roof truss or rafter. Knee Braces – Inclined diagonal lumber braces connecting to and extending from the sidewall columns, usually several feet below the truss to column connection, across and attached to the face of the roof trusses. They are intended to supplement the lateral resistance of post frames when loaded by lateral wind forces. Studies have revealed their ineffectiveness when including diaphragm action. They also may induce over-stressing of the roof trusses. Laminated Veneer Lumber (LVL) – A structural composite lumber assembly manufactured by gluing together wood veneer sheets. Each veneer is oriented with its wood fibers parallel to the length of the member. Individual veneer thickness does not exceed 0.25 inches. Lean-To – A structure, having only one slope and depending upon another structure for partial support. Live Loads – Both static and dynamic loads resulting from the use and occupancy of the building and do not include construction load, or environmental loads such as wind, snow, rain, earthquake or flood. Loads – Forces or other actions arising on structural systems from the weight of all permanent construction, occupants and their possessions, environmental effects, differential settlement, and restrained dimensional changes. Loft – A second story wood floor (normally plywood) supported by beams and joists. Lumber Grade – The classification of lumber in regard to strength and utility in accordance with the grading rules of an approved lumber grading agency. Machine Graded Lumber – Lumber evaluated by a machine using a nondestructive test followed by visual grading to evaluate certain characteristics the machine cannot or may not properly evaluate. Machine-stress-rated (MSR), machine-evaluated-lumber (MEL), and E-rated lumber are three types. The MSR and MEL systems differ in grade names, quality control, and coefficient of variation (COV) for E values. Man Door (or Entry Door or Walk Door) – A pre-hung, hinged door allowing for access into the building by turning a lockset. Most popular size is 36 inches in width by 6’8″ in height. Manufactured Component – One assembled in a manufacturing facility. Generally the pre-fabricated wood trusses and laminated columns used in post frame buildings. Masonry – Anything constructed of materials such as bricks, concrete blocks, ceramic blocks or concrete. Metal Cladding – Metal exterior and interior coverings, usually cold-formed steel sheeting, fastened to the structural framing. Mezzanine – An intermediate floor placed in any story or room. When the total area of any mezzanine floor exceeds 33-1/3 percent of the total floor area in the room, it will be considered an additional story. Monolithic Construction – A method of pouring concrete grade beam and floor slabs together to form the building foundation without forming and pouring each separately. MSR – Machine Stress Rated – Lumber where each piece is non-destructively tested for strength mechanically. Provides for more consistent strength qualities than visually graded lumber. O.C. – Spacing “on center”. The distance between the centers of two members. Open Bays – Portions of walls without cladding, doors or other permanent coverings. 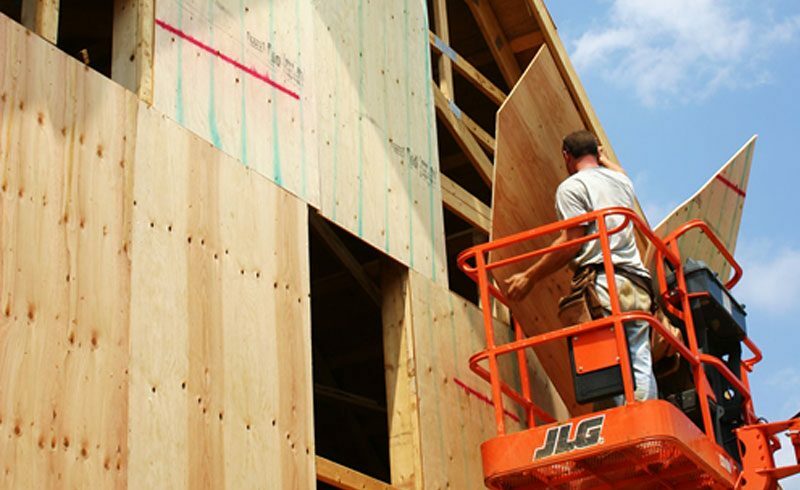 Oriented Strand Boards (OSB) – Structural wood panels manufactured from reconstituted, mechanically oriented wood strands bonded with resins under heat and pressure. Overhead Door – Installs on vertical tracks to the inside face of two building columns. Opens upwards, typically by going around a bend in each of the vertical tracks allowing the opened door to be parallel with the floor and above the top of the door opening. Panels – Sheet metal, usually with a ribbed configuration, used for roof and wall skin. Panic Hardware – A door-latching assembly incorporating a device which releases the latch upon the application of a force in the direction of egress travel. PCF – Pounds per cubic foot. Peak – The highest point of the roof, which describes a horizontal line running the length of the building. Pennyweight – A measure of nail length, abbreviated by the letter d.
Personnel Door (or Entry Door or Man Door) – A pre-hung, hinged door allowing for access into the building by turning a lockset. Most popular size is 36 inches in width by 6’8″ in height. Pin – Short, straight, stiff piece of wire with a blunt head and a sharp point, used especially for fastening. Pitch – The rise or angle of the roof stated in inches of rise per twelve inches of horizontal run. Plumb – Straight up and down, vertical. Plywood – A built-up panel of laminated wood veneers. The grain orientations of adjacent veneers are typically 90 degrees to each other. Pole – A round, unsawn, naturally tapered post. Pole and Rafter (or Beam and Column) – A structural system consisting of a series of rafter beams supported by columns. Often used in animal “stall” or “grid” barns. Post (or Column) – A rectangular primary structural member, sawn on four sides before treatment, is generally uniform in cross section along its length. May be either sawn or laminated dimensional lumber. It is the primary structural element of the building side and end walls. They are a vertical structural member used in a building to transfer loads from main roof beams, rafters and/or trusses to the foundation. Usually also supports a horizontal wind load. Generally partly embedded in the soil to provide lateral and vertical support for the structure. Post Embedment Depth – Vertical distance between the bottom of a post and the lower edge of the skirt board. Post Foundation – The embedded portion of a structural post and any footing and/or attached collar. Post Frame – A structural building frame consisting of a wood roof truss or rafters connected to vertical timber columns or sidewall posts. Post Frame Building – A building system whose primary framing system is principally comprised of post frames. Pressure Preservative Treated Wood – Wood pressure impregnated with an approved preservative chemical under approved treatment and quality control procedures. Primary – The main structural load carrying members of a system. Generally comprised of the columns, trusses, rafters and other main support members. PSF – Pounds per square foot. Purlin – A secondary horizontal framing member attached (generally at a right angle) to roof rafters or trusses. Laterally supports rafters and transfers load between exterior cladding and rafters/trusses. Serves as a structural member to which roof sheathing or roofing is attached. They resist gravity loads and uplift loads under wind loading conditions. As such they are a key structural element of the roof diaphragm assembly. Rafter – A sloping roof framing member. Rake – The part of a roof projecting over the endwalls. In the absence of an endwall overhang, the rake is the line along the endwall formed by the intersection of the wall and roof planes. Reactions – The resisting forces at the column bases of a frame, holding the frame in equilibrium under a given loading condition. Residential Overhead Door (or Overhead Door) – Consists normally of a combination 21″ or 24″ height raised steel panels, the width of the door opening. Ridge (or Peak) – The highest point of the roof, which describes a horizontal line running the length of the building. Ridge Cap – A transition of the roofing materials along the ridge of a roof. Roof Live Load – Those loads induced by the use and occupancy of the building, not including wind, snow, seismic or dead loads. Roof Overhang – The portion of the roof extending beyond the sidewalls and/or endwalls of a building. Roof Snow Load – Vertical load from weight of snow applied to the horizontal projection of the building roof. Influenced by a number of factors besides ground snow load, including roof slope, temperature and coefficient of friction and wind exposure. Roof Truss – An engineered building component functioning as a structural roof support member. Made up of three or more members, with each member designed to carry a tension or compression force. Assembled from wood members, metal connector plates and/or other mechanical fasteners, designed to carry the roof truss weight as well as superimposed loads. The truss members form a semi-rigid structural framework and are assembled so the members form triangles. Attached to the wall columns, they compose the post frames of a post frame building, are the primary structural elements and part of the windforce-resisting system. Scissor Truss – Roof truss designed with a bottom chord sloping upwards to an interior peak at the center of the building. Allows for increased interior clearance as the center of the building is approached. May require a steeper than standard exterior roof slope. Screeding – The process of striking off the excess concrete to bring the top surface of the concrete to proper finish and elevation. Sheathing – OSB, plywood or steel roof covering which transfers roof load to purlins, rafters and/or trusses. Sidewall Truss Bearing Columns – A rectangular primary structural member, sawn on four sides before treatment, is generally uniform in cross section along its length. May be either sawn or laminated dimensional lumber. It is the primary structural element of the building side walls. They are a vertical structural member used in a building to transfer loads from main roof beams, rafters and/or trusses to the foundation. Supports a horizontal wind load. Generally partly embedded in the soil to provide lateral and vertical support for the structure. Skirt Boards (or Splash Boards) – Pressure treated lumber installed at grade line to which the bottom of the building siding is normally installed. Sliding Door – Typically found in pure agricultural or animal confinement buildings. Door is typically a metal framework with a steel cladding skin and moves horizontally along a building face. Supported on top edge by two sets of trolley wheels running through a horizontal steel track attached to the face of the building. Soffit – The underside covering of roof overhangs or mansards. Soil Pressure – Load per unit area the foundation of a structure exerts on the soil. Solid Sawn – A structural wood member comprised of an individual piece of lumber. Span – Horizontal distance between two points. Specialty Contractor [from RCW 18.27.010(3)] – Means a contractor whose operations do not fall within the definition of “general contractor”. Splash Boards (or Skirt Boards) – Pressure treated lumber installed at grade line to which the bottom of the building siding is normally installed. Static Loads – Result from the weight and/or pressure from equipment, livestock, and stored products and the materials used for construction and maintenance activities. Stitch (or Seam) Screws – Fasteners used to connect two adjacent pieces of metal cladding, and thereby adding shear continuity between the sheets. Stress – A measure of the load on a structural member in terms of forces per unit area. Structurally Glued – Laminated Timer Post (or Glulam Timber Post) – An assembly in which the individual layers are joined together with a structural adhesive. Stud – A vertical wall member to which exterior or interior covering or collateral material may be attached. May be either load bearing or non-load bearing. Threaded Nail – A type of nail with either annual or helical threads in the shank. Generally made from hardened steel and have smaller diameters than common nails of similar length. Timber – Wood members five or more nominal inches in the least direction. Top Chord – An inclined or horizontal member establishing the top of a truss. Transit (or Building Level) – A surveyor’s instrument in which a telescope is mounted horizontally. Parallel to the ground, it can be used to determine a level point or points. Trim (or Flashing) – Light gauge metal used to cover exposed edges of steel claddings, especially around openings and at intersection of surfaces, or bare untreated lumber. Generally includes: base, eave, jambs, around windows and doors, fascia, varges and ridge. Twist – A curl or spiral of a piece of lumber along its length. Measured by laying lumber on a flat surface so three corners contact the surface. The amount of twist is equal to the distance between the flat surface and the corner not contacting the surface. UBC – Uniform Building Code – This code is dedicated to the development of better building construction and greater safety to the public by uniformity in building laws. The code is founded on broad-based principles that make possible the use of new materials and new construction systems. Uplift – Wind loading on a building which causes a load in the upward direction. See also Suction. Vaulted Truss (or Scissor Truss) – Roof truss designed with a bottom chord sloping upwards to an interior peak at the center of the building. Allows for increased clearance as the center of the building is approached. May require a steeper than standard exterior roof slope. Vented Ridge – Allows warm, moist air to escape from the building through the peak of the building, providing an adequate air intake (e.g. gable or eave vents) is provided. Ventilation – The natural or mechanical process of supplying conditioned or unconditioned air to, or removing such air from, any space. Wainscot – Material on the lower few feet of a wall or walls, divided from the upper portion of the wall. Used primarily as an aesthetic feature. However, if using steel panels for wainscot, provides ease of replacement of future damaged or dented panels. Walk Door (or Entry Door, or Man Door) – A pre-hung, hinged door allowing for access into the building by turning a lockset. Most popular size is 36 inches in width by 6’8″ in height. Web – structural member joining the top and bottom chords of a truss. Web members form the triangular patterns typical of most trusses. Width – On main building, distance measured from outside of wall girt at corner column to outside of wall girt at corner column across the building endwall. Wind Loads – Loads from wind coming from any horizontal direction. Zinc-Aluminum Coated – Steel coated with zinc and aluminum for corrosion resistance. Sometimes referred to by trade names such as Galvalume or Zincalume.